The plays of Tennessee Williams' post-1961 period have often been misunderstood and dismissed. In light of Williams' centennial in 2011, which was marked internationally by productions and world premieres of his late plays, Annette J. Saddik's new reading of these works illuminates them in the context of what she terms a 'theatre of excess', which seeks liberation through exaggeration, chaos, ambiguity, and laughter. Saddik explains why they are now gaining increasing acclaim, and analyzes recent productions that successfully captured elements central to Williams' late aesthetic, particularly a delicate balance of laughter and horror with a self-consciously ironic acting style. 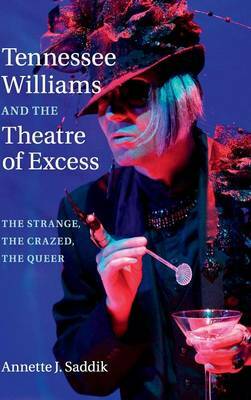 Grounding the plays through the work of Bakhtin, Artaud, and Kristeva, as well as through the carnivalesque, the grotesque, and psychoanalytic, feminist, and queer theory, Saddik demonstrates how Williams engaged the freedom of exaggeration and excess in celebration of what he called 'the strange, the crazed, the queer'.